tension with a union-averse employer whose profit-driven model had led to less than ideal conditions for both students and teachers. CAVA is a network of schools operating in affiliation with K12 Inc., the nation's largest presence in the online school market. 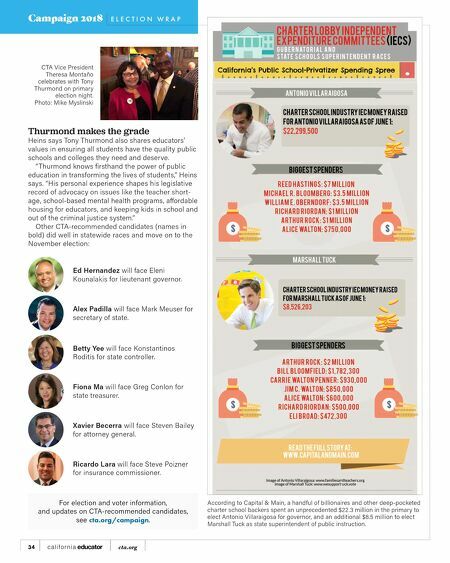 K12 has been in business since 2000 and in California since 2002 (see sidebar), but CAVA teachers felt its increasing focus on profits has resulted in dete- rioration of the instructional program, lack of resources for students, and underpaid, overworked and frustrated teachers. That frustration led to a small group of CAVA teachers discuss- ing the idea of forming a union, a daunting task given that at the time the school had about 750 teachers who were spread all over the state with limited opportunity to engage in person. In 2013 they reached out to CTA staff in the Sacramento area for advice. They formed an organizing team and began outreach to colleagues. They set up a closed Facebook group, which built solidarity and a sense of community, and gradually became a safe space for teachers to air concerns. Many of those concerns centered on ever-changing, top-down policies that didn't benefit students. Concern for students Bri anna Carrol l i s a four th-year C AVA t each er and C VEU 's current and first union president. " Teachers were concerned By Frank Wells Virtual educators fought for their students, not company profits How CAVA Teachers Won a Contract n April , California Virtual Educators United (CVEU) members voted by an overwhelming 98 percent to ratify a contract agreement with Cal- ifornia Virtual Academies (CAVA). 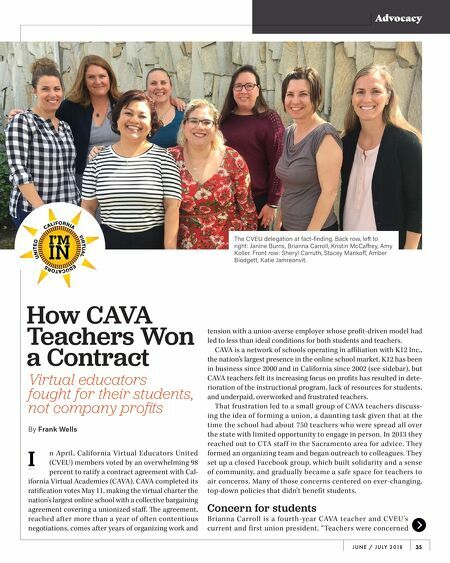 CAVA completed its ratification votes May 11, making the virtual charter the nation's largest online school with a collective bargaining agreement covering a unionized staff. e agreement, reached after more than a year of often contentious negotiations, comes after years of organizing work and I 35 J U N E / J U L Y 2 018 Advocacy The CVEU delegation at fact-finding. Back row, left to right: Janine Burns, Brianna Carroll, Kristin McCaffrey, Amy Koller. Front row: Sheryl Carruth, Stacey Mankoff, Amber Blodgett, Katie Jamreonvit.